IRVINE, Calif. (BRAIN) — Fox Racing has named NorthernMark Agency, based in Pleasanton, California, as sales agency for the company’s newly restructured Northern California / Northern Nevada region. IRVINE, Calif. (BRAIN) — Felt Bicycles has announced that sales representative Juan Diaz will expand his territory to all of Southern California. In addition to the California territory from San Luis Obispo in the north to San Diego in the south, Diaz also handles Nevada, Arizona and Hawaii. ASHEVILLE, N.C. (BRAIN) — The Eastern Outdoor Reps Association and New England Sports Reps, two trade groups, are merging to become Eastern Active Sports Reps.
ASHEVILLE, N.C. (BRAIN) — The Mann Group has added a new workshop for bike industry sales reps to its Mann U offerings. DENVER (BRAIN) — Haibike has hired Chris Facas as a new territory manager to support retailers and promote sales throughout the Northeast United States. Facas, former territory sales representative for Specialized and Jamis, will begin representing Haibike immediately. ALISO VIEJO, Calif. (BRAIN) — Highway Two has hired two new field reps: a company-direct rep in the Mid-Atlantic and an independent rep in New England. James Mattock is the new company-direct rep and Marc Sheehan has taken the independent rep role in New England. NORTHVALE, N.J. (BRAIN) — G. Joannou Cycles has added two new members to its sales team for its Jamis and Nirve brands: Jason McCormack and Mark Hubbell. TAMPA, Fla. (BRAIN) — American Classic has hired Xavier Scheepers as its sales manager for Europe. GRAND RAPIDS, Mich. (BRAIN) — TerraTrike, a manufacturer of recumbent tricycles and tricycle accessories, is expanding its dealer sales team with the addition of Jessie Gater. LEXINGTON, S.C. (BRAIN) — Hawley has added two new reps to its sales team. Jeff Stephens will cover Arizona, New Mexico and Las Vegas, while Adam Wilk will cover Texas. The distributor now carries Sidi, Forcefield Body Armor and Suomy helmets. SANTEE, Calif. (BRAIN) — Ciclista-America, formed in 2013 as the exclusive U.S. distributor of Sidi cycling shoes, has expanded with the addition of Forcefield Body Armor, and most recently, Suomy cycling helmets. 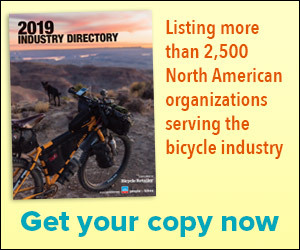 CHARLOTTE, N.C. (BRAIN) — Bike2020.com, an online marketplace for new, closeout and overstock bikes for pickup at local bike shops, has expanded its sales rep team. LONGWOOD, Fla. (BRAIN) — Subrosa Brand Bikes has contracted with the Dennis Lee Co. and Manual Sales and Marketing to represent their brand and The Shadow Conspiracy. Dennis Lee will offer the brands in Florida, while Manual will sell in Oregon and Washington. Both brands are owned by Sparky's Distribution.